When building a house the first thing you focus on is its foundations. Similarly, a high-quality face wash for men sets the foundation of any good male grooming and skincare regime. Cleanse properly and you set your skin up for the rest of your routine – and the day ahead. Typically, a good face wash is formulated with hydrating glycerin – making it effective but gentle on the skin. It will also be pH-balanced to protect the skin’s protective ‘acid mantle’ and not strip the skin of its essential natural oils. To use, mix a face wash with a little warm water to generate a lather in the palm of your hands and massage into damp skin twice daily, morning and night. Do this for around 30 seconds at a time. It’s important to always use running water when you wash; if you fill the basin and wash from that you’ll just be putting dirty water back onto your skin. You should also consider using a high-quality face scrub twice a week to remove dead skin cells and debris. Of course, there are many variants in terms of smell, texture, consistency and effect. We believe these intricacies are all personal preference. Where we can advise – and where it really matters – is to ensure you pick the right face wash for your specific skin type. You may see varying product names when browsing, with the majority either labelled a cleanser or a wash. In the male grooming market, they’re often used interchangeably so don’t worry too much about this. These day, most men’s face washes tend to be gel- or cream-based. One thing to avoid, however, are bars of soap as they are often over drying. Every gentleman’s face has its own unique characteristics and concerns – this determines your skin type. There are five common categories: oily skin, dry skin, sensitive skin, normal skin, and combination skin. Read on to assess which skin type best matches your skin, where you’ll also find Ape’s top picks for the best face wash to suit. If you’re lucky enough to have normal skin (the scientific term for healthy skin is eudermic) this guide is almost irrelevant as any face wash you’ve tried likely won’t be causing an issue. Your skin is well-balanced, it’s not flaky, red and sensitive, or irritated, and has no oily sheen (except for maybe a little at the T-zone, which is normal) or blemishes. You have good blood circulation and unremarkable pores. It’s still a wise move to regularly cleanse, and as such maintain that healthy-looking complexion. Consider it a preventive measure against potentially pore-blocking dirt, which may cause blackheads or, worse, blemishes. 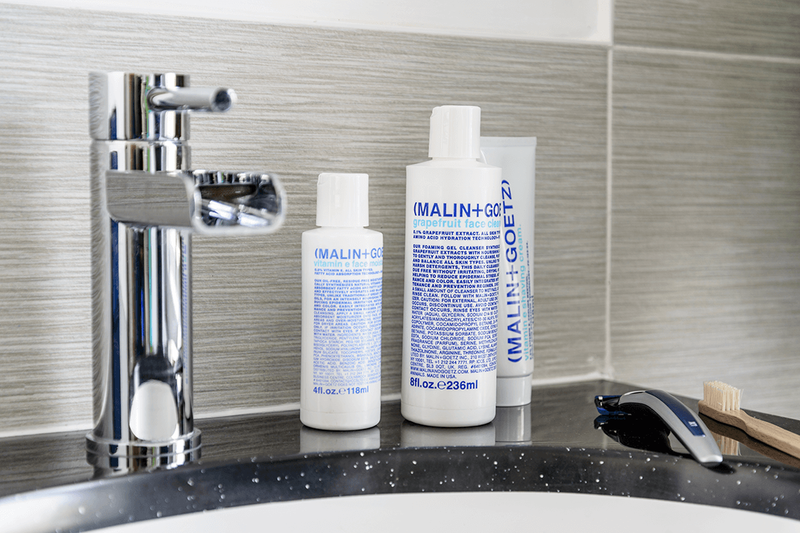 Malin+Goetz Grapefruit Face Cleanser: a foaming cleansing gel that synthesises natural grapefruit extract with amino acid-based cleansing agents. There are no traditionally harsh detergents that can dry, strip and irritate. Just a formula that gently and thoroughly purifies and hydrates all skin types, especially normal. Natural fragrance and colour. To hydrate the skin, your body produces a natural oil named sebum – it helps maintain the correct pH balance and homeostatic condition. However, given men have thicker skin than women, there is a higher likelihood of excessive production of oil (known as seborrhea). Other telltale signs of oily skin include large, visible pores and a greasy shine. Naturally, you need a face wash that cleanses, ideally regulates oil production but crucially doesn’t over-dry or strip your skin of sebum. An aggressive cleanser will remove the majority of your skin’s natural oils, which will have a welcome initial result but soon after, your skin will likely go into overdrive and up its sebum production to counteract the effect. The result is excess oil. If you can’t get your oily skin under control then it’s worth seeing a dermatologist to assess for any hormone changes or imbalances, medication induced issues, stress or comedogenic (irritating) skincare products. Aesop Amazing Face Cleanser: a non-drying daily cleanser enhanced with purifying Mandarin Rind to effectively cleanse the skin without disturbing its natural balance. Designed specifically for oily, combination and open-pored skin, and for those in warm and humid climates. The result is refreshed, balanced and thoroughly clean. Dry skin (Xerosis) is characterised by flaky and itchy skin which often feels tight. This is, in the main, due to an underproduction of sebum. Skin therefore lacks the lipids that it needs to retain moisture and build a protective barrier or shield against external influences. Skin will always lose water (or hydration) through perspiration, trans-epidermal water loss and a lack of natural moisturising factors so it’s important for dry skin sufferers to adapt their diet and up their water intake. Men with dry skin need a face wash that removes dirt and impurities but not natural oils. Choose a hydrating cleanser which will nourish and hydrate, the opposite of over-stripping and excessive drying out of skin. 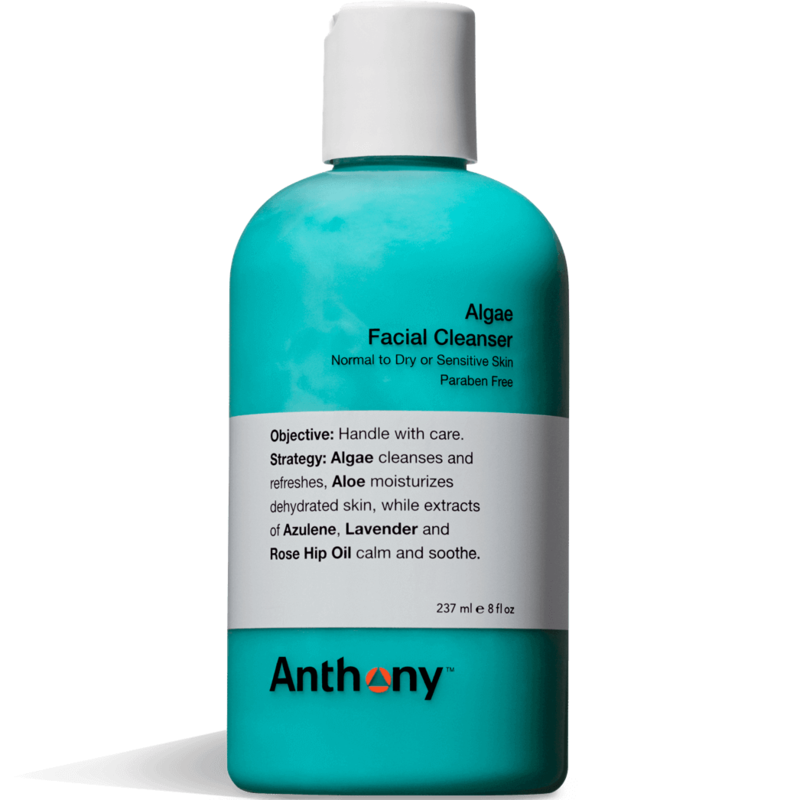 Anthony Algae Facial Cleanser: the gentle Algae Facial Cleanser from New York City-based Anthony moisturises and soothes the skin, leaving it feeling soft, smooth, and clean. Designed specially for dry, sensitive and mature skin it employs nourishing Algae, soothing and moisturising Aloe Vera, as well as calming and soothing Lavander Extracts and Rose Hip Oil. Countless men consider their skin sensitive. But this often relates to their beard area, and a result of poor shaving hardware and software. A good shaving cream and quality razor will rectify this. Crucially here, don’t confuse the skin on your beard area with the skin on your face (nose, cheeks and forehead), each part of your visage requires a different approach. Sensitive facial skin is characterised by a tendency to be easily irritated and often red. A cleanser that features no drying alcohol, synthetic fragrance nor harmful chemicals (of which there are many) is your best bet. A good face wash for men with sensitive skin will likely incorporate skin-soothing ingredients such as Aloe Vera and Chamomile. And respect your skins’ pH level – it’s often a case of less is more here. Avoid any fancy-sounding ‘hero’ products that promise the earth and also consider that natural isn’t always best; many man-made ingredients have been tried and tested, and tried and tested over and over again, to ensure sensitive skin suitability. CeraVe Hydrating Cleanser: this hydrating and soothing facial cleansing lotion is designed specifically for sensitive facial skin that is normal to dry and prone to irritation, including eczema. A soap free, non-foaming lotion which gently removes dirt and oil while increasing skin hydration after just one use. Combination skin often leads to some confusion, but it’s quite simple: gentlemen with combination skin often have an oily forehead, nose and chin, but dry cheeks. Again, look for a face wash that banishes dirt and oil but doesn’t strip your skin of its natural oils, respecting the skin’s natural barrier. You need a product that thoroughly cleanses but also provides hydration where needed. REN Clarimatte™ T-Zone Control Cleansing Gel: a gel cleanser formulated specifically for combination skin. Designed to cleanse and fight future breakouts without over-drying. This light gel works directly on your skin’s oiliest areas, the T-zone, gently removing excess sebum and minimising enlarged pores while helping to fight congestion and blackheads. Skin is left cleansed and balanced, blemishes are reduced, your skin feels really clean, and balance is restored. Forget about space-age technology in skincare, and opt for simplified products. The best face washes for men is the one that suits your skin type and delivers on its promise. We believe our recommendations above are the best choice available within each category, after all we’ve tried 99% of men’s face washes on the market.